Contrary to what I wrote in this month’s column for Sue -magazine, I really really enjoy reading. Just today I went to the local bookstore and to my delight found the latest issue of Sound On Sound there. A cursory glance through the pages revealed that it had reviews of Moog‘s new SlimPhatty, Arturia‘s Origin Keyboard -hardwaresynth and a multipage pictorial report on Soma studio which is the Chicago home of Tortoise. I bought the magazine, hurried home and sat in one of our nice 70’s sofa-chairs with a glass of lemonade on the table. Pure sunday bliss. The first thing I read in the magazine was the SlimPhatty review, but for some reason it couldn’t keep my interest up for more than one and a half pages, then I rushed to the end of the magazine and started reading about Tortoise’s studio. This Chicago-band pretty much defines postrock for me and I couldn’t resist the temptation any longer. I wanted to know everything about the equipment they’ve used on certain tracks and the methods John McEntire uses in recording their double drum-sets and how they’ve slowly in the last 15 years moved away from vibraphones and replaced them almost completely with synths. I looked at the pictures from their studio wide-eyed and would’ve wanted to have a magnifying glass to have a closer look at their numerous vintage effects units. I gobbled up every piece of information on the band and at one point just had to get up and put Millions Now Living Will Never Die in the cd-player. The list of synths Tortoise has in their studio read out like a who’s who of rare synths. They have the Synton Syrinx, the OSC OSCar, Elka Synthex and the infamous EMS VCS3. 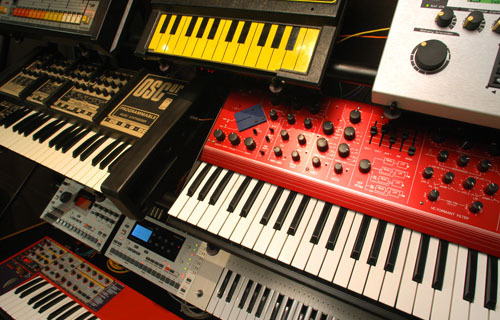 I have none of those synths and actually prefer my Japanese collection to those, but once again reading a good article on a band and their synths inspired me to come to my study, turn on my own synths and start fiddling. There’s nothing wrong with that. So if you’ll excuse me, I’m going to sync all my CV/Gate -controlled synths together, run them through an analog delay-unit and try to sound like Edgar Froese in 1976.